Lock in a great price for 21C Museum – rated 9.4 by recent guests! Bed, room temperature, cleanliness & penguins!! The beds were comfy; room service quick and food was great! Lovely bedding and amenities in the room. Really enjoyed the ambience and being in a museum environment. Very convenient to the Crystal Bridges museum, we walked there. Hotel restaurant and bar is excellent, but hotel is also near several good restaurants. Classy, easy sophiscation surrounded by wonderful small town charm at your doorstep. The location was perfect, a block from the main square and a nice half-mile walk to the museum. The sculptures in the hotel, especially the basketball hoops and the penguins, are great. The restaurant was very good. The room was so quiet and got a great nights sleep. Beautiful facility with fun art. Had a great breakfast at the Hive. 21C Museum This rating is a reflection of how the property compares to the industry standard when it comes to price, facilities and services available. It's based on a self-evaluation by the property. Use this rating to help choose your stay! Opportunities to discover art are around every corner at the Museum Hotel 21c Bentonville. The 104-room boutique hotel has more than 12,0 feet of exhibition space seamlessly integrated into all areas of the property. Upon arrival, guests are greeted by two dramatic pieces – “Orange Tree,” a large-scale sculpture, and “Making Change,” a Fleetwood Cadillac limousine covered in thousands of coins. From there, guests can enjoy the thought-provoking art galleries that are open every day, as well as the contemporary decorations and artwork in each guest room and suite, which also feature high ceilings and large windows with comfortable beds, custom-designed furniture, flat-screen TVs, and Malin + Goetz bath amenities. The hotel is also home to The Hive, a restaurant proudly showcasing the unique culinary identity of Arkansas, with local ingredients and a refined country cuisine. This property also has one of the top-rated locations in Bentonville! Guests are happier about it compared to other properties in the area. This property is also rated for the best value in Bentonville! Guests are getting more for their money when compared to other properties in this city. When would you like to stay at 21C Museum? 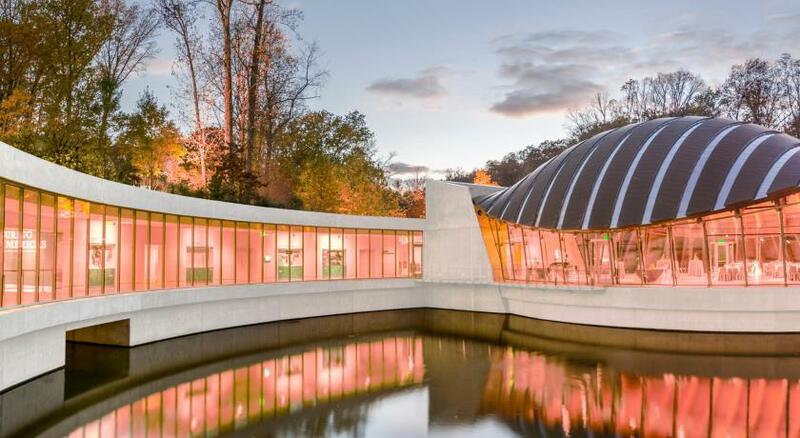 Located on the northeast corner of the town square and a short walk to the new Crystal Bridges Museum of American Art, 21c Museum Hotel Bentonville will welcome both visitors and members of the community to experience its rotating exhibitions, participate in its programs and enjoy its culinary offerings. With an active street presence, 104 rooms and more than 12,000 square feet of art-filled exhibition, meeting and event space, 21c Bentonville will present curated rotating exhibitions and live art events. Culinary creativity abounds in NW Arkansas’ newest dining destination, The Hive. Chef Matthew McClure brings the best out of local ingredients with his refined country cooking. The four-story contemporary building, like 21c Louisville, will be woven into the fabric of downtown. House Rules 21C Museum takes special requests – add in the next step! 21C Museum accepts these cards and reserves the right to temporarily hold an amount prior to arrival. Style show fog machine set off fire alarm in middle of the night. causing an evacuation of the hotel. Good I thought was a bit subpar. Breakfast the eggs and grits were good, the sausage over cooked dry, coffee cold. A little flat in experience for the money. Great restaurant. Solid check-in experience. I love this hotel. The bed was fantastic, pillows firm but not hard. The furniture was actually comfortable. The bathroom was gorgeous and I loved the soap/shampoo selection. I had room service one night, and though it seemed pricey at first, it was fast and the quality of meat, vegetables, sides, and even dessert was amazing. All over it was perfect. Unexceptional for amount charged. Also remodeling and painting during business hours.